Midnight Solar's MNEPV80 is one of the largest DIN mount 1 pole breakers available rated at 150VDC. These breaker operates at its full rated capacity in repeated cycles without any damage. It can be used in Midnite Solar Baby Boxes, E-Panels, DC-disconnects and combiner boxes. They will also fit Outback Power combiner boxes and enclosures and many other enclosures with the standard 53mm DIN rail. 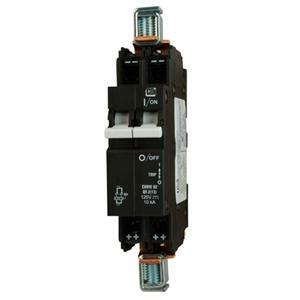 The 80Amp DIN rail breaker consist in two 13mm breakers mechanically bonded together. One breaker takes up two 13mm slots in the box or enclosure. The breaker terminals accept up to #2 AWG wire.